According to The Washington Post’s Valarie Strauss “Teachers are often expected to remain politically neutral in class, not letting their students know which candidate they support or where they stand on controversial issues” (Strauss, 2016). Parents may anticipate that teachers could “indoctrinate” students by expressing their own views in classrooms (Strauss, 2016) and as a result, so many teachers are tentative to discuss their political views. Given that “teachers teach who they are” (Susan Drake, n.d.), it’s hard for teachers to be neutral in their passions for education and especially for the inclusion and equity of students. I state that the act of teaching is a political act as classrooms hold future citizens and what teachers say and do matters. Teachers teach children to become creative, collaborative communicators, critical thinkers, problem solvers, and global citizens. Teachers help their students become good citizens or as Dewey stated the “organization of the school, as it affects the mind of both teacher and pupil, [is a] growth and extension of the democratic principle in life beyond school doors” (Dewey, 1903). The act of advocating for democracy and human rights in schools is a political action – so should teachers be political? Former state and national U.S. Teachers of the Year wrote in an open letter “there are times when a moral imperative outweighs traditional social norms. There are times when silence is the voice of complicity” (cited in Strauss, 2016). As teachers, we regularly espouse ideas of supporting human rights, through equity and inclusion. In the act of teaching, we are the political messengers of these ideas. Teachers are role models for students as we set the example through what we say and do. Our students watch our every move in our words and our actions. Teachers’ words and actions matter. 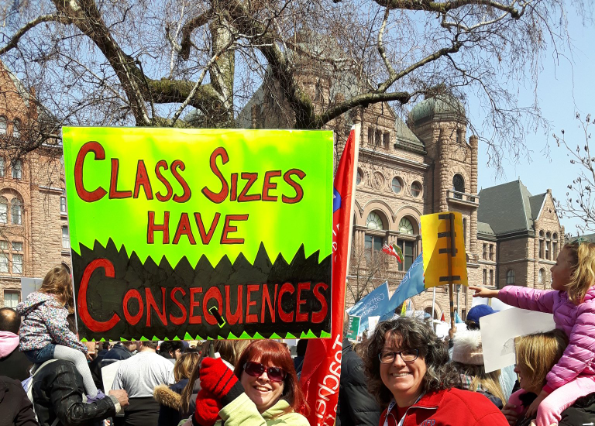 In Ontario politics, teachers’ voices matter and our representation and advocacy through our unions matter. Through the Ontario Teachers’ Federation, teachers represent almost 200,000 voices in Ontario. Teachers’ votes matter! Results of Ontario political outcomes directly impact education funding for schools, staff, and students. In 1994, the election of Mike Harris cut billions of dollars from education (Martin, 2009). By the time I became a teacher in 2000, classrooms were void of resources – teachers ended up filling this gap directly with money out of their pockets. Teacher salaries are also directly regulated by provincial governments. Politics impacts teachers’ net income. Teachers have built their advocacy for public education through their boards of education and their agency through their unions. Should teachers talk about which political party they will vote for on this 2018 Provincial Election Day? Probably not, but teachers can just be who they are … advocates for public education, advocates for human rights, and advocates for the inclusion and equity of all students. Above all, teachers can be advocates for democracy. The most impactful act a citizen can do to support democracy is to vote. Teach who you are, be who you are. Vote. Dewey, J., (1903). Democracy in education. The elementary school teacher, 4(4), 193-204.